If you make it to both shows (registration will be available at our merch table), we’ll give you the free stuff at the second show. You’ll have the choice of a CD or T-Shirt AND a lighter or a pin. Free stuff and choices! Please note that if you don’t register at the first show, we’ll get all confused and not know what to do when you go to the second show. So register at the Reggies show, and when you show up at the Double Door show, we’ll have you on our list and give you stuff. Every now and again we get into a bit of cumulative band malaise that makes us wonder why we do what we do. And then there’s you. You – our fans and friends – constantly offer us reminders of why we do what we do. A handful of Ideamen were at the DFD show in Joliet. We were quite surprised at the number of Ideamen shirts we saw there, and we only knew most of the people in them. Thanks for representing, that means a lot to us. The interrelationship between DFD/Polkadot and Ideamen has been a wonderful bonus, as fans of both bands mix and overlap and share with each other. Tim sold a lot of Ideamen CD’s while he was out on the road with DFD. Thanks to all the folks that bought them, special thanks to Izzy Peter Frehley for your post on The Facebook about your initial response to Schemata. Speaking of The Facebook – thanks to everyone for making a visit to our page a pleasant experience. We feel Like liked. So, in this brief moment of introspection – know that YOU are really the driving force behind Ideamen. Your passion for Ideamen is greater than ours, is bigger than us, has grown into a life of it’s own and that big giant thing goads us on into continuing to do what we do. You’ve turned us from a teensy local band into something of an institution (if we may be so bold). You’ve taken us all over the country and shown us hospitality and good times all around. Some of you even let us use your showers, beds, floors and kitchens. All of you are awesome. Thanks. Hello folks! Ideamen has taken a little break while Tim is on the road with Dog Fashion Disco. We’re working on a new album, there’s a handful of rough tracks – can’t wait to hide them from you until we can share them with you. Tonight Tim has a Chicago area show with DFD, we’re going. I guess I fixed the van just in time. She started spilling coolant like a faucet last week, and I couldn’t figure out where it was coming from. 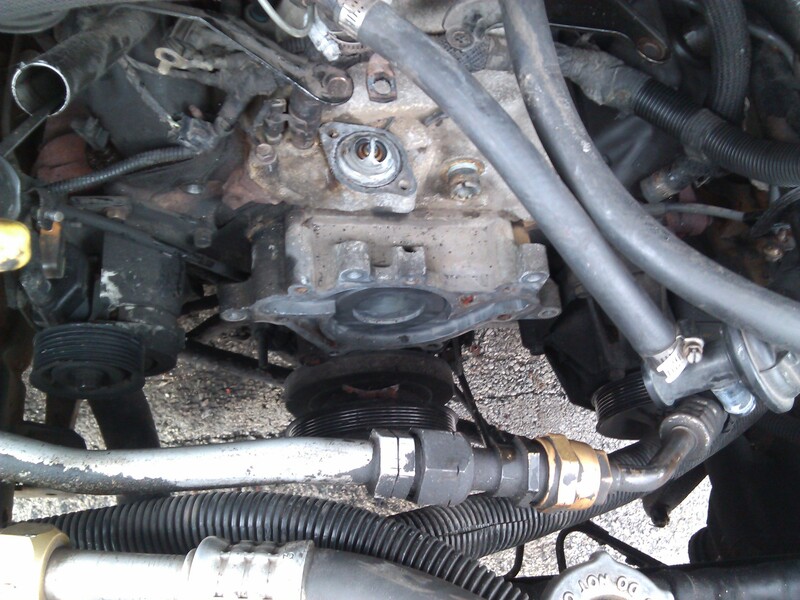 It was a little scary, it soooo looked like it was coming right out of the engine block. Turned out to be the water pump. I broke down and decided to do it myself, much to the chagrin of my battered and cut up hands. 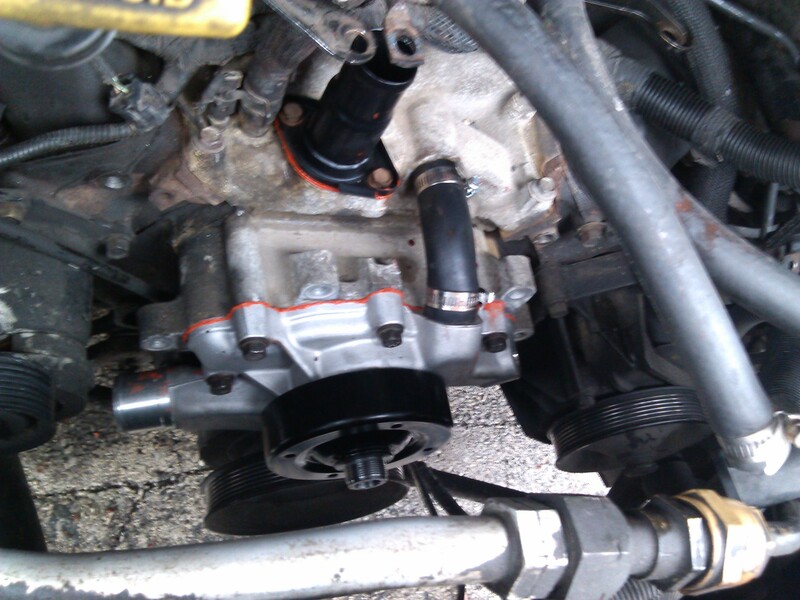 It took removing the alternator, the AC compressor, and the bracket that holds them both on – just to SEE the water pump. It’s done now, and she doesn’t leak any more. I’m going to Joliet to see DFD now. See you there! Mark and Christine got a dog! Her name is Gemma, and she’s adorable. She was sort of rescued from the euthanasia farm – she’s got a messed up snout, one lung, and a bit of a coughing problem. But she’s adorable. We cleaned and reorganized the practice space. It needed it pretty bad. It’s much nicer now. We particularly enjoyed the show at The 5th Quarter in Indianapolis IN on Saturday. All the bands were great, the crowd was fun and plentiful, and there was face painting. Thanks to all y’alls that made that happen. Hey! We’re going to try (try harder!) to feed the site with at least a weekly update on how things are going in the world of Ideamen. We’re doing well. Thank you very much. Hah! Just kidding, that’s not all. We had a blast at the JJ Kelleys show with I Decline and Team Hoss. The sound was fantastic, so fantastic in fact that we performed really well. So well that we might post a video of the show in it’s entirety (we got video of most of our performance). Keep an eye out for that. The IdeaVan hitch has been fixed! Thanks to the Millers for their assist. It got us to the Kelleys show and it didn’t fall off yet. Video of that coming soon as well. Mark is getting a new dog! Cute dog pics are on their way. All that said… there’s a lot of stuff on the way. Time to get to work! See you next week. Hey we’re playing a show this weekend! We’ll be playing this Saturday April 12th at J.J. Kelley’s in Lansing IL. This show almost got bumped, it was actually double-booked. We won the drawing of the straws. Come and hang with Ideamen, I Decline, and Team Hoss. We tried something new for this one… a video promo. Maybe next time we’ll make a video for a bigger show. Bwaaahaahaaaaa! “Running Home” Video Broke 3000 Views! The “Running Home” Video Broke 3000 Views on YouTube! Fantastic, thank you! Hey folks! We finally got around to removing the rest of the hitch from the IdeaVan. It took some doing, but it finally came off. We had the van looked at by Shawn Klus, he’s the guy we go to when I don’t trust my automotive know-how. He says it’s worth keeping around for another year or so, in fact he tried to convince me that we could push it to 300,000 miles. Next step will be to take it to Phil Millers dad and have him patch up the van frame and the hitch, then put them back together again. All told it doesn’t look as bad as it… looked. I was concerned about the rear leaf springs, Shawn says they are in good shape. There’s a handful of bushings and joints in the front end that will need replacing, but that’s kid stuff and they’re all cheap parts. What we learned from all of this, if we had something to share that might be useful – a van and trailer is an essential element of an efficient band. I didn’t say successful, that is a different battle. But efficiency is really, really important to a band, on every level. If your simple conversations are inefficient, you waste time talking. If your rehearsals are inefficient, you waste time playing. If your travel is inefficient, you waste money and time driving. The last show we played was in Chicago, our hometown. With the trailer unusable we had to take 3 vehicles in order to get all of us and our gear down the street, which really isn’t a big deal – you might think. We lost money playing that show just paying for gas. Granted it wasn’t a huge show, it was a comfortable place that we’re familiar with. We made a reasonable amount in show pay and a decent chunk in merchandise (more than we’d anticipated) – but it still didn’t offset the total cost of gas for the night. Wow… We used to do that all the time. Now I remember why we got a trailer in the first place. Let me start off by saying that Ideamen as a whole is a little… stressed right now. The IdeaVan lost it’s hitch, and there’s a lot of other little things piling up on our to-do list. Our trip to the Quenchers show was our first trailer-less show in a long long time, and we forgot how to drive 3 vehicles to a show in Chicago. Sigh… But when we got there – Kelly had a gift for us. It’s a beautiful music box doll called The IdeaLady. Thanks Kelly! You brightened our days!